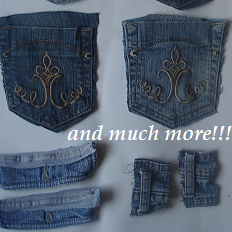 Level 8 Craftling: Jeans Parts Giveaway! Front of the unfinished "skirt" - intact pockets, metal zipper, belt loops, and a good amount of denim. Back of the unfinished "skirt"
4 back pockets, 2 pocket flaps, and 2 pieces with belt loops attached. How can I enter? Leave one comment before Friday, May 25th at 5 pm PST (8 pm EST)! I'd love to know what kinds of things you like to make with parts of jeans, though if you'd rather just leave a random comment, that would be fine, too. I will pick a random comment to be a winner with a random number generator. You said two giveaways. What else have you got? I am also giving away a plushie Creeper that I made by hand. It is a mob from the game Minecraft, which I play obsessively some weeks.